Student affairs professionals have a new option for graduate-level learning and professionalization. Wilfrid Laurier University’s Faculty of Education has launched a new field of study (FOS) in Student Affairs as part of its Master of Education degree program. The program will welcome its first cohort of students in May 2018. The field of study in student affairs examines a cross-section of services that affect the quality of students’ postsecondary experiences, such as academic support and services; academic advising; student life; residence education; wellness and recreation; work, leadership and volunteering. Students in the program will develop the requisite skills and knowledge to assume leadership roles in an array of student affairs services at the postsecondary level. Montero developed the program to address the lack of professional learning opportunities for student affairs professionals. Few graduate-level programs focused on the study of student affairs exist in Canada, she says. David McMurray, vice-president of student affairs at Laurier, contributed to the program’s development. McMurray has more than 40 years of experience in student affairs and is known nationally for his contributions to the field. Faculty members in Education, many of whom have been recognized for their teaching excellence and professional development, will teach in program. 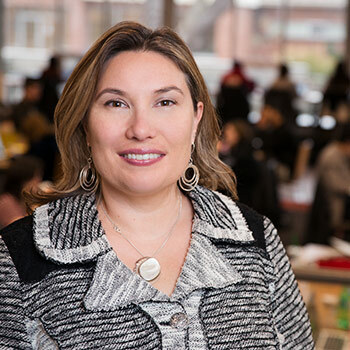 Montero is widely celebrated for her teaching, receiving awards from Laurier, Syracuse University in New York and Northern Illinois University’s College of Education in Illinois. She also has a certificate in global mental health (trauma and recovery) from Harvard Medical School at Harvard University in Massachusetts. Steve Sider, associate professor, has expertise in leadership development among educational professionals. He is the founder of Laurier’s Haiti Educator and Leadership Institute (HELI), an exemplary social innovation project that supports capacity building among educational leaders in developing nations. Sider was nominated for the prestigious Yidan Prize, an international accolade that supports initiatives with the demonstrated potential to globally transform education. Carolyn FitzGerald, assistant professor, has a doctoral degree in clinical psychology and is an expert in youth and adolescent mental health. She developed an online, multi-module certificate for K-12 educators to understand and support student mental health issues and their impact on the classroom environment. The certificate has received participation from educators across Canada. The student affairs field of study is offered part-time over two years. Eight half-credit courses are required, including a capstone seminar focused on experiential learning. Required courses will explore a cross-section of student affairs services that impact the quality of students’ postsecondary experiences, providing professional knowledge in areas such as collaborative learning and instruction, innovative education and emerging technologies, and high-impact practices for teaching, learning and leadership. Applications for first consideration will be accepted until Jan. 15, 2018. Questions about the program can be directed to the graduate program assistant at edugrad@wlu.ca.